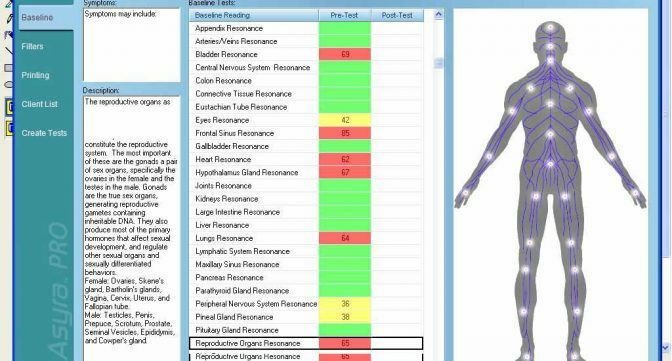 What is Asyra Pro bio resonance? What health problems may be helped? Although it is not a diagnostic device, it may help to improve the health and wellbeing of anyone, no matter what their state of health may be. The energetic tests may provide useful information to help people suffering from the symptoms of, for example: allergies; arthritis; asthma; candida; depression; digestive problems including irritable bowel syndrome; low energy levels & fatigue; food sensitivities; headaches; hormonal issues; hyperactivity; insomnia; menopausal problems; ME; MS; migraines; parasites; PMS; skin problems; stress; thyroid problems; weight gain or weight loss and much more. Everything in existence is energy. Medicine recognizes we are electromagnetic beings and has a long-standing tradition of using diagnostic machines. MRI machines work with magnetic energy. Ultrasound machines use high frequency sound energy. EKGs are an electronic representation of what is in the heart. EEGs are an electronic representation of what is in the brain. The Asyra system works by measuring the body’s energetic signatures in much the same way physical muscle testing does: if a glyphosate test vial is placed in your body’s energy field and a practitioner pushes on your arm (using kinesiology), it will go weak because glyphosate is known to be a toxic substance to the human body. Glyphosate may disrupt the human energy field just as it disrupts cellular metabolism in the body. We are affected by our environments in different ways. If you see, taste, smell, touch or hear something you especially like, you will most probably have good thoughts and your body will physically respond. For example, saliva is produced when smelling a food you enjoy, or you might relax if you hear a soothing piece of music etc. But if you experience something you don’t like, you will respond differently, e.g., with tension, shallow breathing, thoughts of how to avoid it, etc. 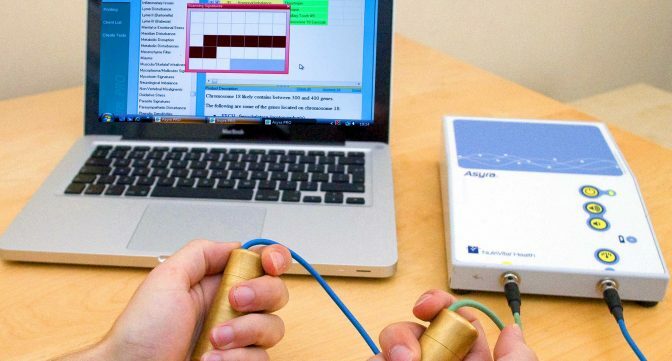 Bio-feedback is the body’s electrical process of monitoring body responses to different stimuli. The Asyra transfers energetic signatures or frequencies of different stimuli through the body and records how it responds. Though the system does not “diagnose” as such, it can detect energy signatures of imbalances long before conventional tests can find it. The Asyra will register frequency imbalances corresponding to physiologic abnormalities. It will then imprint the remedy the Asyra calls for along with items to balance the problems that were identified. If a frequency from the Asyra encounters a molecule that shares its frequency, then “resonance” occurs, such that the return signal of that frequency will register as a voltage drop. This signifies that the entity “looked for” by the specific frequency is or has been present in your body. One can think of resonance in the same way as an exact note will shatter glass. Asyra uses actual substances for resonance signatures, strength of energetic imprints and clinical endorsement by some of the finest clinicians in America for example. Each session starts with a survey of the status of organ systems. Although some energetic balancing systems test individual acupuncture meridians, the Asyra tests the organ systems without the need for precise location of points or application of pressure to get reproducible results. By determining the stress points first, the Asyra can focus on the priority for that time. Many technical studies, tests and research papers have been produced, verifying the effectiveness of the process. 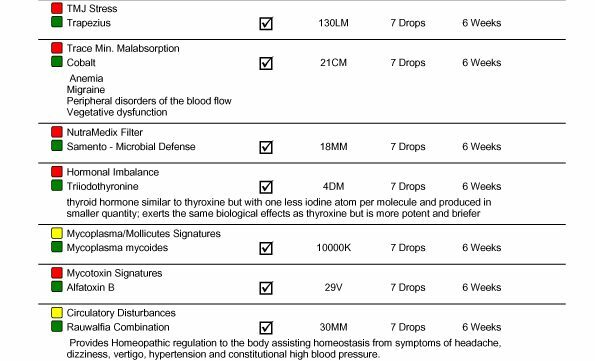 “In one study, a 97% correlation was found with blood tests for thyroid dysfunction.” The Asyra Pro is used by many health practitioners, including medical doctors, nurses, chiropractors, osteopaths, homeopaths, naturopaths, kinesiologists and nutritional therapists worldwide. What happens at an Asyra screening and how does it work? Using a simple and safe low voltage circuit formed by the client holding two brass cylinders, the response of the body to the output by the Asyra hardware is recorded via electromagnetic signals. This response is measured via small changes in the skin’s electrical resistance and then relayed back to the software. Reports are generated on the computer of any responses that are outside specific limits. Then a process called bio-feedback tests and records the body’s energetic response to various substances. The Asyra screening doesn’t take long, but you should allow up to 90mins for the entire process. This allows time for an initial consultation where a case history will be taken so that you can outline any health problems or concerns you have. Time will also be needed after the test to interpret the results and explain the findings to you, to run any further tests if required, and to discuss any health recommendations with you. Will I have to give up certain foods altogether? The Asyra may indicate some foods that could be causing an issue at the moment. Generally, it’s advised to lessen or cut out consumption of some of the foods for 2 to 4 weeks. Will the digital remedy affect any medication I am taking? No, the digital remedy which is produced at your consultation will not interfere with medication. It works on an energetic level which is different to the way drugs are processed in the body. How do I take the digital remedy? The remedy is available in liquid drop form dosage for most people. The drops should be administered under the tongue. You can either see how many drops you are taking by looking in a mirror and counting, or by dropping into a small amount of water. Hold the water in your mouth for 30 seconds or so before swallowing. The remedy can also be imprinted on special patches which stay on the body for up to a week if taking drops is problematic. Keep the bottle away from electronics (microwave ovens, cell phones, I-pods, pagers, magnets, x-rays, etc) to avoid external imprinting. Because homeopathic remedies serve as catalysts for change (just like a light switch will turn on lights as long as you have operational bulbs), there is the potential for a detoxification reaction with your sublingual drops. In fact, a reaction is often a confirmation that the homeopathic agent is addressing an important condition. If you experience a detoxification reaction, reduce the number of drops for a few days and then resume the original dosage. For the months of April – June the cost is £95 for an initial consultation of up to 90mins, and £75 for a follow-up test lasting around an hour. 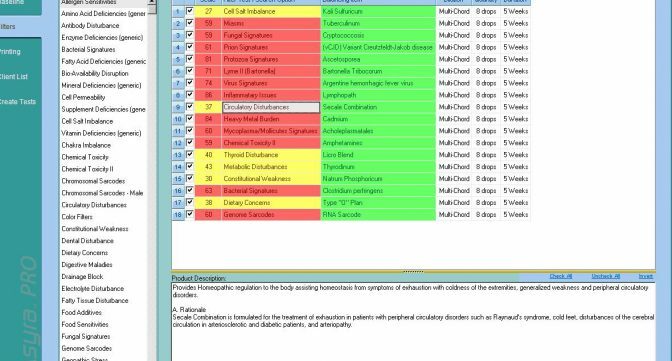 The price includes the emailed Asyra test reports and a digital remedy. Follow up appointments are recommended as they help you to see your progress. it is not possible to determine how many evaluations are necessary as it depends on your life experiences, exposures, genetics, and energetic nature. The programme tests against 18,000 substances. Also, healing often occurs in layers, and once one layer is dealt with, the next can be addressed. It is usual for clients to have a follow-up appointment 3 to 6 weeks after their first consultation, depending on the recommended time given for taking the remedy. The follow-up session helps to monitor progress and it may take between 2 and 12 follow-up sessions before you notice an improvement in your health. This will mostly depend on the severity of your initial health issues and how much of the diet and lifestyle recommendations you are able to implement. It is entirely up to you to arrange a follow-up session but most people seem to achieve the benefit they were hoping for after the third session. An annual Asyra test, thereafter, may help to keep you on track.